Like millions of other people, I am a fan and a user of Amazon. They do make buying things convenient, especially little things that you might have to go to art specialty stores to find. I’m a huge user of the Kindle app on my iPad, especially since I learned that I do not technically own the books I buy from the Apple bookstore. If I ever wanted to migrate away from an Apple product, I could not take my books that I purchased on Apple to a competing platform. Not only can I do that with the Kindle app, I can highlight and make notes in the books, and they show up on my Amazon Kindle page, where presumably they will reside forever, so that in 20 years I can go back and review what I thought was important about a particular book. If I could do that for every book I’ve read in the last 50 years, I would be dangerous. I will admit that I don’t quite understand the Amazon business model of growth over profits, but I have noticed that most of the profits Amazon actually makes are coming from their noncommercial side – stuff like cloud services. Be that as it may, there is a semi-dark side to Amazon. They are slowly but surely eating retail jobs. 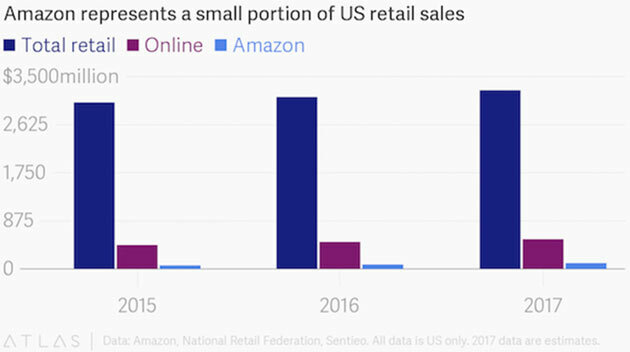 Now, to be fair, Amazon represents only a small portion of US retail sales, but it accounts for an outsized portion of the growth in retail sales. And, again to be fair, Amazon does not do even a majority of online sales, since other online retailers are just as aggressively pushing their own products. To be even more fair, a great deal of the problem in American retail jobs and businesses is that we simply have too many retail stores. Reasonable analysis that I’ve read suggests that we have anywhere from 10 to 15% more retail stores than we actually need. Now, that’s good for competition and choice, but it is just one more reason why there is going to be a consolidation in retail companies and further losses of retail jobs. What’s that going to do for the wage-inflation issue? Today’s Outside the Box is two short notes on Amazon from the Quartz Media website. They actually have a great deal of material on Amazon, as well as on other companies – both news and analysis. I am actually kind of teeing up this weekend’s letter, where I will first and quickly review the jobs report that comes out Friday morning and then talk about the future of jobs and why Fed policy, which is based on backward-looking models that no longer have any application to our future, may be poised for trouble. As we head into 2018, there are a few dark clouds here and there, but I am mostly optimistic. I do think the primary risk in 2018 will be major central bank policy errors. I will probably repeat these figures again this weekend, but between the $450 billion that the Fed intends to pull out of its balance sheet and the $500 billion by which the ECB is going to reduce its QE, there will be almost $1 trillion going into the market. Since the Fed, and especially Ben Bernanke, took credit for the rise in asset prices induced by its QE, why this Fed thinks that quantitative tightening (QT) will have no effect at all on the market is quite beyond me. It’s one thing to raise rates, which they should have done years ago, and it’s another thing altogether to raise rates and fire up a QT program at the same time. As I will hopefully demonstrate this weekend, I think they will be doing this at precisely the wrong time and for the wrong reasons. In the meantime, let’s look at one of the technological forces, Amazon, and the tidal wave of online sales that is putting pressure on the retail sales market. You wonder why there has been no wage inflation when, theoretically, unemployment is so low? 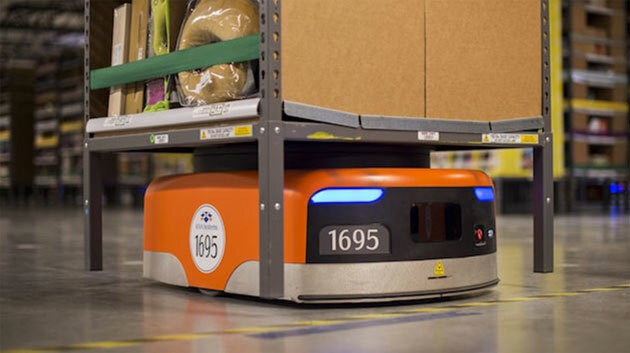 Here’s one of a number of answers: Amazon has hired approximately 75,000 robots just this year. On a personal note, I notice that winter actually seems to have come to Dallas. We had unnaturally warm weather in the spring and fall, and even enjoyed a rather cool summer. We have had three years back-to-back-to-back of exceptional weather, all things considered. I don’t ever remember the weather being this good for this long. But I have lived long enough in Texas to know that the trend won’t last forever. But if it did, I would begin to worry about tax refugees from California coming to populate our state, where they would get much lower taxes plus great weather. I will hit the send button so that the editors can get this letter out on time. You have a great week. There are 170,000 fewer retail jobs in 2017 – and 75,000 more Amazon robots. Amazon’s headcount is growing by 40% year-over-year. It was the eighth-largest private employer in the US at the end of 2016, and it’s poised to climb those ranks quickly. The online retailer also announced plans to build a second US headquarters that will employ 50,000 employees. But Amazon’s growth comes at a cost. It has a well-earned reputation for overwhelming competitors. 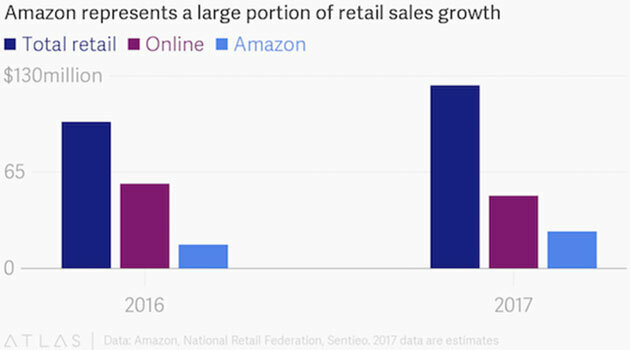 Even though Amazon represents a small portion of the overall retail industry, it dominates the industry’s sales growth. We wondered: Does Amazon create more jobs than it destroys? We assembled employment data for the retail industry as a whole, and for Amazon in particular. We estimated year-end results for 2017, based on current trends. Assuming the current industry trends continue through the end of the year, the number of employees in Amazon-related retail (that is, retail that Amazon competes with, such as book stores, as opposed to areas it doesn’t compete with, like gas stations) will decline by about 1% year-over-year. While that’s a small percentage, the number of job losses would be 170,000. That would be the first annual decline since 2009. Amazon’s employment increases won’t be enough to cover the losses in the rest of the industry. We have assumed Amazon will maintain its current year-over-year headcount growth rate and will add 146,000 employees worldwide in 2017, a 43% increase (excluding Whole Foods employees). Even with that aggressive growth assumption, and including Amazon employees worldwide, the combined employment at Amazon and Amazon-related retail would still decline by 24,000. Amazon has already added 55,000 robots this year and its growth rate is accelerating. The company stated it had 45,000 robots at the end of 2016, added 35,000 robots by the end of the first half of 2017, and then another 20,000 in the third quarter. We’ve assumed another 20,000 in the fourth quarter for a total of 75,000 new robots in 2017. 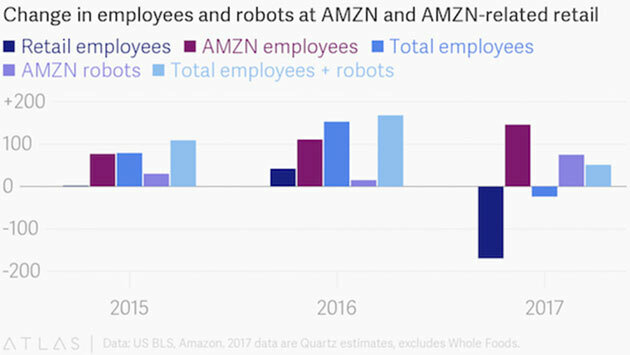 While it may be difficult to prove causality, it’s not difficult to see the correlation between a decline of 24,000 human employees and an increase of 75,000 robot employees. Amazon’s growth and efficiency (driven by AI and automation) are key to why its stock has performed so well. The company is increasing its investment in robotics and, in our assumptions, machines could represent 20% of the total employee base by the end of the year. That increase in automation drives efficiency and growth and makes Amazon investors happy—especially relative to the retail industry as a whole. 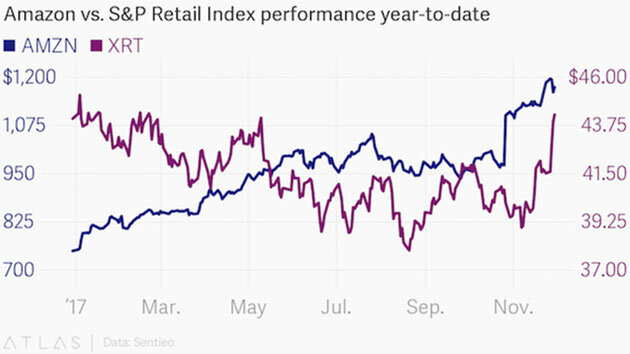 While the S&P Retail Index is flat this year, Amazon’s stock is up 57%. The National Retail Federation (NRF) has forecast that retail-industry sales will grow by around 4% in 2017. (US Census Bureau data also confirms that growth rate through the first nine months of the year.) Online shopping is growing even faster—at 10% so far this year. Amazon’s US business represents 35% of that growth. And Wall Street analysts estimate that the company will represent 51% of all US online sales growth by the end of the year. That means that Amazon will represent 20% of the entire US retail industry’s growth in 2017—even though it only represents 3% of overall US retail sales. Amazon’s growing army of robots may seem helpful and benign but they are also highly effective at terminating human retail employees.